The three counselors were chosen out of 106 personnel who were nominated by a review committee made up of YMCA leadership staff. Each nominee was judged on their efforts to go “above and beyond the call of duty” as camp counselors and for the transformational experience they create for fellow staff and campers alike. The award ceremony was held at the Huntington YMCA in Huntington, N.Y. on Thursday, August 16, 2018, prior to the start of college. For more information click here. 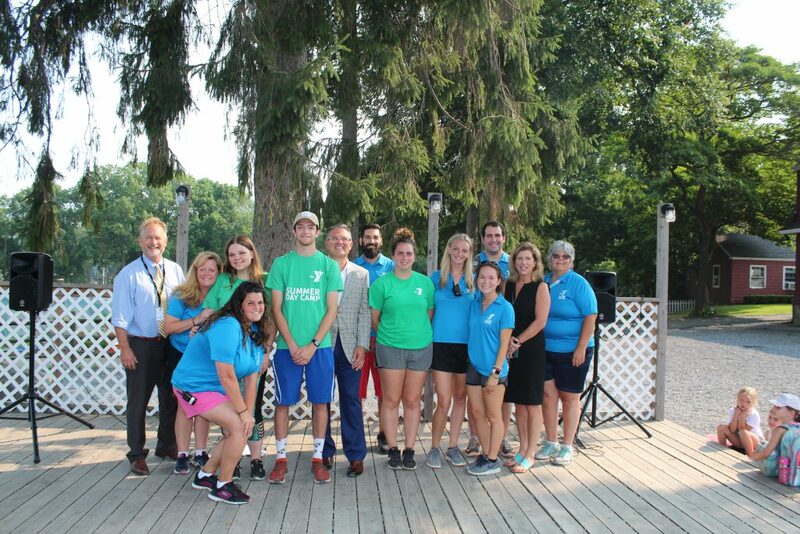 Huntington YMCA camp leadership staff and Eileen Knauer, YMCA LI Chief Operating Officer, pictured with Peter J. Klein, President of The Claire Friedlander Family Foundation who awarded “The Claire Award”, a college scholarship of $2,500 each, to Shea Naughton, Dan Miele, and Mackenzie Maloney (accepted by her sister, Shannon Maloney, pictured). The three award recipients, pictured in green t-shirts, went above and beyond the call of duty, being selected out of more than 100 personnel.